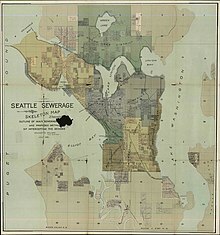 Sewerage is the infrastructure that conveys sewage or surface runoff (stormwater, meltwater, rainwater) using sewers. 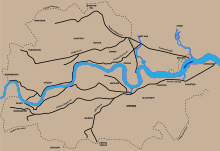 It encompasses components such as receiving drains, manholes, pumping stations, storm overflows, and screening chambers of the combined sewer or sanitary sewer. Sewerage ends at the entry to a sewage treatment plant or at the point of discharge into the environment. It is the system of pipes, chambers, manholes, etc. that conveys the sewage or storm water. It is also an alternate noun for the word sewage. In American colloquial English, "sewer system" is applied more frequently to the large infrastructure of sewers that British speakers more often refer to as "sewerage". The main part of such a system is made up of large pipes (i.e. the sewers, or "sanitary sewers") that convey the sewage from the point of production to the point of treatment or discharge. Severe constraints are applied to sewerage, which may result in premature deterioration. These include root intrusion, joint displacement, cracks, and hole formations that lead to a significant volume of leakage with an overall risk for the environment and public health. For example, it is estimated that 500 million m3 of contaminated water per year can leak into soil and ground-water in Germany. The rehabilitation and replacement of damaged sewers is very costly. Annual rehabilitation costs for Los Angeles County are about €400 million, and in Germany, these costs are estimated to be €100 million. Hydrogen sulfide (H2S) is indirectly responsible for biogenic sulfide corrosion and consequently, sewers need rehabilitation work. Various repair options are available to owners over a large range of costs and potential durability. One option is the application of a cementitious material based on calcium aluminate cement, after a cleaning of the corroded structure to remove loose material and contaminants in order to expose a sound, rough and clean substrate. Depending on the concrete condition and contamination, the cleaning can range from simple high pressure jet water cleaning (200 bar) up to real hydro-demolition (2000 bars). One method to ensure sound concrete is exposed is to verify that the surface pH is superior to 10. Low pressure wet spray: this method is the more common because it does not produce dust and virtually no material is lost by rebound. It utilizes classical facade rotor pump, easily available in the market. The main drawback is the limited pumping distance that cannot exceed 75 meters. Spinning head wet spray: this method is similar to the first, but the manual spraying is replaced by a spinning head projecting the mortar onto the repaired surface. This method is fast and especially suited for cylindrical chambers such as manholes. When a structure is so severely corroded that human entry is a risk, spinning head application permits an “un-manned” consolidation of the manhole. High pressure dry spray: this method, also called “shotcrete” or “gunite” is allowing a faster rate of rehabilitation, and also to make a thicker application in a single pass. The main interest of dry shotcrete is the capacity to pump the mortar over a long distance and this is needed when the access points are distant. Perhaps the longest dry shotcrete distance is a job site in Australia in 2014, where 100% calcium aluminate mortar was air transported over 800 meters before being sprayed. The main drawback with dry shotcrete is the generation of dust and rebound; these could be limited and controlled with appropriate means (pre-moisture ring, adapted aggregate grading, experienced nozzleman, water mist cut-off walls, etc.). Sewer system infrastructure often reduces the water table in areas, especially in densely populated areas where rainwater (from house roofs) is directly piped into the system, as opposed to being allowed to be absorbed by the soil. In certain areas it has resulted in a significant lowering of the water table. In the example of Belgium, a lowering of the water table by 100 meters has been the result. The freshwater that is accumulated by the system is then piped to the sea. In areas where this is a concern, vacuum sewers may be used instead, due to the shallow excavation that is possible for them. In many European countries, citizens are obliged to connect their home sanitation to the national sewerage where possible. This has resulted in large percentages of the population being connected. 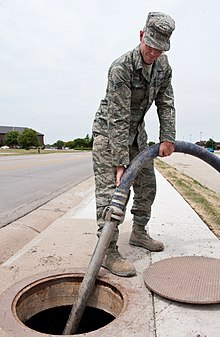 For example, the Netherlands have 99% of the population connected to the system, and 1% has an individual sewage disposal system or treatment system, e.g., septic tank. Others have slightly lower (although still substantial) percentages; e.g., 96% for Germany. ^ Kaempfer, W., Berndt, M., 2009. Estimation of service life of concrete pipes in sewer networks. Durability of building materials and components, 8, 36-45. ^ Sydney, R., Esfandi, E., Surapaneni, S., 1996. Control concrete sewer corrosion via the crown spray process. Water Environment Research, 68 (3), 338-347. ^ "Beleid tegen watertekort dringt zich op". deredactie.be. ^ "Publicaties — Vlaamse Milieumaatschappij" (PDF). vmm.be.